Its Sabroso Saturday again (well its Monday but let’s pretend okay) and due to life unforeseen circumstances I could not post this recipe last Saturday but better late than never right? Ms. Latina’s Sabroso Saturday is a virtual potluck, where we all bring our favorite dishes into play. We share recipes, stories, and reasons to drool. Haha. I am sure you will all love this because its just so delish! On a trip to Connecticut, while visiting my brother and his family, I was introduced to Chaulafan! 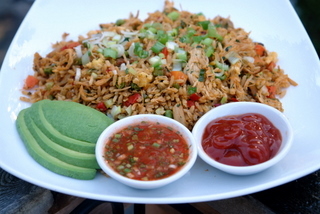 Chaulafan is an Ecuadorian Chicken Fried Rice. Its sensational. It has so many wonderful flavors. Its also filling but be careful, you’ll always end up wanting more! 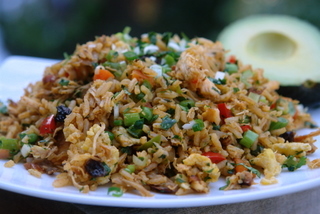 In my research for the perfect Chaulafan recipe I found Laylita’s website and I fell in love. 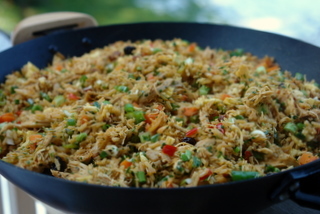 She has some amazing photos, recipes, and information on delicious Latin foods. Be sure to check it out. Bring the water, carrots, onions, celery and herbs to boil in a large pot, add the chicken and cook over medium heat for about 1 hour or until the chicken is very tender and fully cooked. Remove the chicken from the broth and save the broth. To cook the rice, heat the butter, add the onions and the rice, stir well. Then add the broth, bring to a boil, then reduce heat to low, cover and simmer for about 20 minutes. Meanwhile debone the chicken and reserve the chicken meat for later. Heat the first 2-3 tbs butter or oil over medium heat in a large pan to prepare a refrito or base for the chaulafan. Add the chopped onions, diced pancetta, crushed garlic, 1 tbs Worcester sauce, 1 tbs soy sauce, cumin, cilantro, hot pepper powder, and achiote powder; cook for about 5-8 minutes or until the onions are soft. Add the cooked rice, chicken meat, and diced bell peppers. Stir well and cook over medium high heat for 5 minutes, stirring occasionally. Stir in the remaining soy sauce, remaining Worcester sauce, scrambled eggs, peas, carrots, raisins, mix well. Add the chopped herbs and green onions. Serve with avocado slices, aji or hot sauce, and ketchup (or spicy ketchup).